First up on the blog is a post about the wonderful singer songwriter Ruby and the night of music she curated at Hackney Attic last Friday to celebrate the release of the acoustic EP recorded with her band, the RibCage. 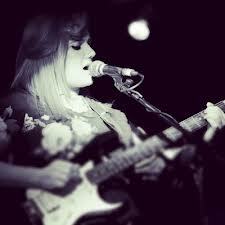 Ruby is the lead singer and driving force behind London based band Ruby & the RibCage. The band have recently changed musical direction and are honing a new electric sound that is a departure from their folky acoustic songs of former times. The EP, The Runaway Ceiling, released by The Davenport Collection, features their original sound (and line up) which includes a double bass, viola, violin, drums and guitar. It is a showcase for their modern folk sound, but recently the band line-up has been edited and Ruby currently performs with drummer Sam Pert as a duo. The music is now much more stripped back, and they are currently on the hunt for an electric guitarist to complement Ruby’s powerful vocals. For those who have never seen her perform, it is difficult to convey just how powerful and mesmerising her voice is. Combined with her beautiful lyrics and melodies, watching her sing is spellbinding, there is a certain magic about her that many artists simply don’t have. She is one very talented vocalist. Her lyrics are very poetic and it is difficult to pigeon hole their sound into one category, or make comparisons to a single band or artist. Jenny Eells from BBC Introducing says simply: ‘If Kate Bush, Florence and PJ Harvey, were all melted down and put in to a pot, I reckon we’d get close to Ruby.. I was captivated’. Ruby’s talent is demonstrated to its full potential while she sings an enchanting acapella of a song she wrote travelling in India, accompanied simply by the rhythmic clapping of her hands and tapping of her head. It is a pleasure to watch her perform and you feel you are witnessing something very special. 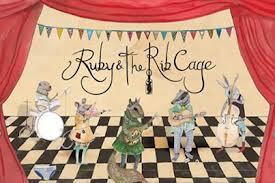 Poster art for the Ruby & The RibCage party. Design by Joss Dickinson. Illustration by Emily Woodard. The rest of the sell-out gig in Hackney Attic, the great space above Hackney Picturehouse, was an equally wonderful affair. With low level lighting and candles the atmosphere in the packed out room was great, my only criticism being that the crowd was a little noisy while the bands were performing which was at times distracting. The gig featured some other brilliant acts which are well worth checking out… Ruby performed alongside Sam Pert and Cara Sebastian with her new band, MARINE, Bristol based KERRY ANN-TING gave an enchanting performance singing her indie-folk tunes, while London based AMBERLAND band provided an indie-rock soundtrack. In a short break from the music, London based performance collective, THE LATE NIGHT SHOP, gave a cabaret-style performance with a twist. ITSMRJACK finished the night’s proceedings by playing an eclectic set of electronic music – the perfect end to a smashing gig. It was a superb start to the weekend and my three pounds was very well spent.